"It's the once, only chance to make the dead live again." 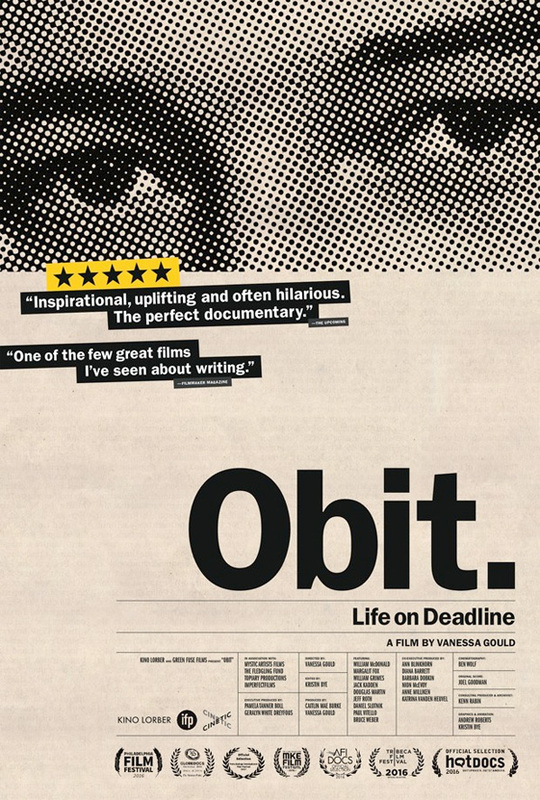 Kino Lorber has released an official trailer for the documentary titled Obit., about the lives and work of obituary writers. The description explains that this is supposedly the first ever doc about obituary writers, which is likely true. However, it makes me think of the film The Last Word, which is not a doc but an indie comedy about an obituary writer (played by Amanda Seyfried). From the description: "Going beyond the byline and into the minds of those chronicling life after death on the freshly inked front lines of history, the film invites some of the most essential questions we ask ourselves about life, memory, and the inevitable passage of time. What do we choose to remember? What never dies?" This already played at doc festivals all over and opens in very limited theaters later this month. It's a shame no one wants to talk to them at parties, because obituary writers are a surprisingly funny bunch. Ten hours before newspapers hit neighborhood doorsteps—and these days, ten minutes before news hits the web—an obit writer is racing against deadline to sum up a long and newsworthy life in under 1000 words. The details of these lives are then deposited into the cultural memory amid the daily beat of war, politics, and football scores. Obit. is the first documentary to explore the world of these writers and their subjects, focusing on the legendary team at The New York Times, who approach their daily work with journalistic rigor and narrative flair. Obit is directed by filmmaker Vanessa Gould, of Between the Folds previously. This premiered at the Tribeca Film Festival last year and has played at many other doc festivals. Kino Lorber will release Obit in select theaters starting on April 26th. More info here. Interested?